Founded in 1987 and based out of Minneapolis, MN, the Sleep Number company specializes in mattresses, bases, and total bed solutions that provide you with optimum levels of sleep. 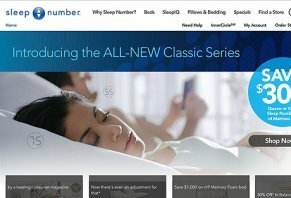 With their A+ rating through the Better Business Bureau, Sleep Number wants you to wake up refreshed and ready to take on the day, and according to their website, their main mission is to improve lives by improving the sleep experience. Sleep Number beds feature dual air technology, with air chambers that work in conjunction with a firmness control system in order to allow you to adjust each side of the mattress to your desired firmness. Using a remote control, you’ll be able to choose your sleep number, which ranges between one and 100—higher numbers represent more firmness, while lower numbers represent less. This means that when sleeping with your spouse, you’ll each be able to use your individualized sleep numbers to eliminate pressure points, distribute your weight evenly, and support your body where it’s most needed. According to statistics posted on the Sleep Number website, research has shown their products to reduce back pain for 93% of users, improve sleep quality for 89%, and increase energy for 77%. While Sleep Number’s primary products are their mattresses, you can also purchase exclusive modular and adjustable bases through them as well, in addition to blankets, pillows, comforters, sheets, and more. Most of Sleep Number’s products also include patent pending technology that helps stabilize your temperature throughout the night. All mattresses, bases, and accessories are available in twin long, full, double, queen, king, California king, and split king sizes. If you so choose, you can also purchase protective products that are waterproof and will help fight off stains. The Classic Series is Sleep Number’s most basic model. Queen mattresses start at $899, while king mattresses start at $1399.98. The Performance Series is Sleep Number’s mid-range model, and start at $1699.98 for a queen mattress, and $2299.98 for a king. The Innovation Series starts at $2899.98 for a queen, and $3699.98 for a king. Sleep Number’s top of the line model, the Memory Foam Series, starts at $3199.98 for a queen, and $3999.98 for a king. It’s important to note that remotes are not included in the price of the mattresses, and will increase your total costs by anywhere from $50 to $150. Sleep Number products can be purchased online, over the phone, or at any one of their more than 400 stores across the country. If you need help locating a store, Sleep Number’s website can assist through their “Find a Store” feature. Sleep Number includes a 100-night trial on all purchases, which allows you to return your mattress for a full refund within 100 days of the shipping date if you’re not fully satisfied. However, you will be responsible for shipping costs, and you will not be reimbursed for any setup fees if your bed was professionally installed. In addition, special edition models or closeouts are also not eligible for refunds. Sleep Number claims that their mattresses help relieve back pain, provide energy, and produce restorative sleep. You can control two separate levels of firmness on each side of your bed, which allows you and your spouse to have two different settings without interfering with one another. 100-night trial on select products, which allows you to return your mattress for a full refund if you’re unsatisfied. Numerous complaints of Sleep Number beds that become less effective over time, resulting in returning back pain. Many consumers have complained that air tends to leak out of the mattresses, though Sleep Number does provide guides for beds purchased prior to 2007, 2007 and later, or for customers unsure of their purchase date. The 100-night guarantee does not cover refunds on all products. For example: If you purchase a base and a mattress, you may not be able to return both. Sleep Number beds are pretty good BUT...there are a few things you need to know before you make the purchase. First, if you like a firm mattress, Sleep Number is great because you can keep it firm over time. Second, if you like a firm mattress and your co-sleeper likes squishy, well, you've seen the ads. That stuff you probably figured out. Here's what you may not know: Sleep Number with no foam on top is hard as a rock no matter how low you set your number. So, be prepared to add a mattress topper. The good news here is that if you bought the thin Sleep Number, like I did, sheets will still fit over it. The bad news is that you are going to struggle finding one that doesn't make you sweat and you'll need to replace it every 3 years or so. There are models that have a thick foam top and that's supposed to eliminate the need for a separate topper. But, foam compacts over time so if you get that model, you are right back into the short lifespan of a standard mattress. Finally, Sleep Number beds will need to have parts replaced. You're going to need new air bags, hoses, and a pump. It will happen a lot sooner than the advertising leads you to believe. And, while you wait for these parts to arrive on your doorstep, you're going to be sleeping on your couch. So, you may fall in love with your Sleep Number the first week you sleep on it but be aware that you are going to spend about $200 every other year on parts. We've had ours for 6 years. We've spent $800 on two mattress toppers, one replacement air bag and a replacement pump. Warranty? Yes. That's with the warranty. We spent a fortune on the mattress, base, sheets, pillows, etc. After sleeping on it, my husband had an allergic reaction to the materials which caused welts all over his body. We obviously couldn't keep this. I called customer service to schedule a return and after being on the phone for almost an hour was told I couldn't return the base, the sheets, pillows, and mattress topper. The only thing they would take back was the mattress itself, but still charged me another $199 to pick it up. I am disgusted that a company that is supposed to be top of the line has such terrible policies. I spent a small fortune on this, and they won't refund me until seven days after pick up, which is a month away. I will never purchase anything here again, and will warn off friends and family. My neighbor was going to buy one this week, but after telling them my horror story, they have decided against it. Like the bed but not the buying experience. The i10 bed has great features, and worth the extra money for the foot lift and other extra benefits. Plenty of luxury, comfort, and flexibility. We "mostly" love it. One issue for us is the very wide "gap" between the bed and headboard, so our pillows slip and fall in between, quite often. The Assistant Manager called the next morning but reneged on the pricing that the salesman the night before had agreed to. In addition, the salesman had forgotten to give us the instructions we needed for pre-delivery, and therefore, we had to have the installers come, twice. We previously didn’t know that we needed a frame to connect the bed to the bed board, so we had to first buy one and have the installers come out again. The bed is very nice but be sure that the store’s "top manager" is present (inside the store) before you even get started. In this case, once we came back and met personally with the head-manager, some of the problems got fixed, and he made an effort to make good on some of the issues. To make a long story short, we wanted a Cal King four poster bed frame and a Sleep Number mattress to go into the bed. We ordered the mattress in December 2017 and it was delivered and set up on the 22nd (the setup took less than 10 minutes). We did not have the bed frame yet, we didn't find one we liked for a month or two and then it took a while to get it. We finally had our new Cal King four post bed delivered on April 8th, 2018. We set the bed up and it looked great, we then tried to put the mattress on the bed, well, it didn't fit. It was too wide and it was too short for the bed frame. We naturally thought it was the bed frame, well, it wasn't. In December, when we went to the Tysons Corner Sleep Number store in Virginia, requested if a Cal King P6 mattress was an option, we were told yes, so we paid for it then and there. The salespeople were a little perplexed at the Cal King requested but assured us that we could get it, it might just take a little longer. So instead of ordering a Cal King they ordered just a King, and it is not obvious by all the order codes on the paperwork what we ordered, so we didn't catch it. When the mattress was delivered and set up, there is no tag that says what size mattress you have, so we didn't catch it there either. We did catch it when we tried to put a King mattress on a Cal King bed frame, but customer service says it's past the first 100 days so they will not fix the problem. We recommend anyone doing business with Sleep Number to check what you order and have the salesperson write specifically what you order in plain English on the order form because they will sell you something in stock vs. what you want if they think you won't notice or don't know any better. One last thought. My wife had issues with sales and customer service; she felt like they were treating her like she was dumb and didn't know anything, I also witness this when I talked to them. It might be isolated, but worth mentioning. Our Sleep Number customer number is 1013881647. I went to a Sleep Number store, and it was a great experience. I got a new pillow to try out and to give my opinion on my pillow, and I slept so good and it helped my neck, and my husband is going to get the bed for my birthday. We gave the bed an honest try, but didn't end up liking it. It caused neck pain for my wife no matter what setting we used, and it never ended up feeling comfortable. Lo and behold, we come to learn that the "adjustable base" is not returnable (!). We are out over $4000 on the process, counting delivery and return fees. Quite the incredible scam they have going. Be careful. Terrible company, incompetent staff, overpriced mattress. Sleep Number is one of the worst companies my spouse and I have ever dealt with. The mattresses are overpriced air mattresses and the personnel is incompetent. First off, they had our phone number incorrect from when we placed the order so we received an email telling us that they tried scheduling the delivery of the mattress but could not get ahold of us. We called and corrected the number and finally had the mattress delivered. The drivers couldn’t find our condo (even though there is a map at the front showing exactly where each unit is in the complex). It was installed and the delivery men were nice enough. But from the first night we slept on the mattress we knew we wanted to return it. The next day we called to return the bed and were told we had to wait 30 days. Nowhere on the contract or print information we were given does it say that you have to wait 30 days to make a return. Second what they don’t tell you is that you will not be refunded the close to $179.99 you were charged for delivery and installation AND that you will have to pay another $179.99 to have it removed or you may ship it back yourself for about $120 with their shipping labels. So, we waited the 30 days and called back to return the bed. We were then told that their system was being upgraded and that they couldn’t process the return and they had no idea when the system would be up and running. We were told they would call us back when it was up or that we could call back at some point. Eventually a couple weeks later we called back and the system was up (but no one called us first to inform us) and we got our return initiated. This is when we find out that we were going to get charged for both the initial delivery and for the removal of the mattress. Now we had to wait for the deliver/removal department to call us to schedule our appointment to pick up the mattress. The person on the phone who processed the return asked for contact phone number (this is important for later). We figured it’d be easier if we just paid the extra money and have them pick it up. Well they didn’t call us and it’d been a couple of weeks so we call them instead and we are told that their system is down and that nothing can be scheduled until it’s up and running. So we wait again for them to call us. Eventually we get an email stating that they tried calling us and couldn’t get ahold of us and that we should call them to make the appointment for pick up. When we call them we find out that they had our phone number incorrect, AGAIN, even though the person who processed the return confirmed a contact phone number with me. Okay, so we schedule our appointment and we get a window between 8am-12pm. The day of the appointment, just to be on the safe side we call early in the morning to confirm the delivery people have our correct phone number because they are supposed to call us when they are close by. Well, the person on the phone looks up the phone number they have on record and you guessed it, it’s incorrect, AGAIN. So the person updates it in the system. Mind you this person was pretty rude. We ask her how the delivery people will know about the correct phone number and she dismisses our concern and says they will get the info. So as soon as we hang up with her, we call back to confirm. This person is nicer and says that the delivery people receive a text message with the information. Okay so we wait, and wait, and it’s 11:45am and we haven’t heard from anyone. So we call back and ask what the delay is. The customer service person tells us that the delivery people are running behind but that we will still get our mattress picked up at some point. So we wait again. It’s 1:30pm and we haven’t heard anything. We call customer service again and the person tells us same thing the previous person did, that they are running behind. This time we tell the person that we were told this already earlier and that we were not planning on spending the whole day at home waiting for the mattress to be picked up, if he can somehow find out when they will come. To make things worse, we were moving at that time and needed to be rid of the mattress ASAP. But we were told that their next available appointment wasn’t for a couple of weeks. So we decided to ask for shipping labels instead. At this point we are fuming and ask to speak to a supervisor. Well we never get a supervisor, instead the customer service person tells us that we can get credited the money we were being charged to remove the bed. But since we couldn’t get an appointment soon enough and we’d be using shipping labels then we’d get credited the amount of the labels. So we get transferred to another customer service person to help us with the shipping labels. She tells us that we will get the labels in our email within 48 hours. Days pass and we don’t receive the labels. We call back and are told that the labels had actually been mailed to us. Why did the person tell us she emailed them then? So we get labels emailed to us finally. We pack up the mattress, we mail it back and when we get our credit, it doesn’t show the full amount, that is, Sleep Number still charged us for the shipping labels after we had been assured we would not be charged for them due to our trouble. So we have to call back, AGAIN, to sort out the billing. This is one of the worst experiences we’ve had with any company. We do not recommend Sleep Number. If you want a good mattress, look somewhere else. Do not waste your time and money and keep your sanity. Write a Review for Sleep Number!